Ryan O'Byrne is tied for first on the Bulldogs with two game-winning goals this postseason. MONTREAL - Standing at 6-foot-5, Ryan O'Byrne is tough to miss to begin with. But throughout the Bulldogs' Calder Cup run this spring, the big defenseman is drawing attention for more than just his size. Hardly known for his scoring touch, O'Bryne notched his second goal of the playoffs on Monday to give Hamilton a 2-1 series lead over the Hershey Bears in the Calder Cup Final. The hulking defenseman also delivered the final blow to the Rochester Americans, scoring the series clincher in their first-round match-up. Not bad for a stay-at-home defenseman who picked up 12 assists but failed to light the lamp in 80 games as an AHL rookie with the Bulldogs in 2006-07. "A hockey season is all about peaks and valleys," admitted the 22-year-old rearguard. "While there's a physical element there, it's the mental part that's the toughest. Coming out of the U.S. college ranks, I wasn't used to playing three games in three nights like we do at this level. I think I pulled through ok and I feel like I improved over the course of the season and that's the most important thing." That evolution carried over into the playoffs, with O'Byrne totaling seven points in 20 games to go with his +9 rating, the AHL's third-best differential this postseason. 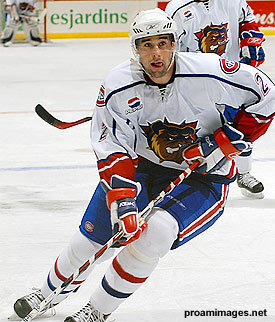 "His transition to the pro game has been pretty smooth," said veteran Bulldogs defenseman Dan Jancevski. "I bet he's seen more action this year than he did in three years in college combined!" Jancevski is bang on, with O'Byrne having suited up for this 100th game of the season on Monday night, after playing a grand total of 92 games at Cornell from 2003 through 2006. "Ryan has a bright future ahead of him, that's for sure," predicted Jancevski. "He'll get his chance to prove what he can do at the NHL level soon enough. He's certainly got the size and this season he's learned how to use it. His work in his own end has also improved." It's been a busy year the Canadiens' fourth pick at the 2003 NHL Entry Draft, but you won't hear O'Byrne complaining. "It's been an amazing ride this year," O'Byrne said. "And what can I say about the electricity at playoff time." Now two wins from a Calder Cup title, O'Byrne should soon have plenty to say about that.